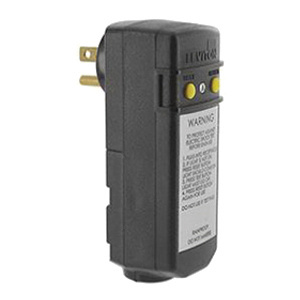 Leviton 2-Pole 3-Wire Automatic reset right-angle GFCI plug in black color, has voltage rating of 120-Volts, current rating of 15-Amps and maximum load rating of 3/4 hp. It has a dimension of 4.482-Inch x 1.675-Inch x 1.729-Inch. It accommodates conductor of size 18-12-AWG. This NEMA 5-15P rated GFCI plug features polycarbonate construction and brass contact. It has a Class A trip level of 5-Milli-Amps (+/-1-Milli-Amp) and Short circuit rating of 2000-Amps. This flammability V2 Rated UL94 plug has a temperature rating of -35 to 66 deg C. This GFCI plug has open-neutral protection, which eliminates the possibility of the load side of the GFCI having a live hot leg. 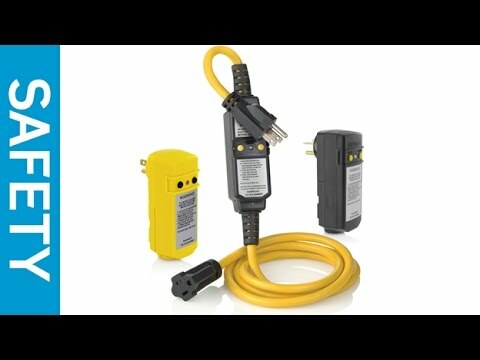 It is great to use in a variety of temporary power applications, such as portable generators, submersible pumps, vending machines and more. GFCI plug is UL listed, CSA/ANSI certified and meets NEMA/NOM standards.